Around 1984, Dana Morgan, who had previously been the general manager of the Santa Cruz Beach Boardwalk designed new cars for the classic Prior & Church designed Giant Dipper. In the 1970’s, the park had replaced the original trains with two trains from Arrow Development. Designed by Dana Morgan at the time of his employment with Arrow Development, those trains were fiberglass shells with no padding and had a trailer design with two axles for the front car and the next car attach to it using a ball joint. They were not very comfortable for the riders and the restraint was a single lap bar per row that locked at a fixed position. When Mr. Morgan revisited the Arrow trains, he kept he same basic design where a fiberglass shell is bolted to a steel frame. That steel frame has all the hardware including the lap bars, wheels, anti rollbacks and chain dogs. When maintenance need to do an inspection, the shell can be removed for easy access to the steel chassis. Morgan improved riders comfort by adding high density foam around the seat and the wheels are mounted on a suspension system in order to absorb some of the vibrations at the bottom of the drops. That suspension has to be carefully maintained or else, the car can get an uncomfortable bounce as it travels around the track. One feature of the lap bar that riders need to be careful with is that both lap bars per car are linked. If one restraint is pulled, the other comes down as well. Those unpadded lap bars had two locking positions and as a rule, parks demanded from their operators that the bars be pushed in so they reach the second secure ratchet. A look at the Morgan train on the Giant Dipper. As you can see, one side is fully enclosed as unloading and loading take place on one side. A close-up of the curved restraint release bar and side release mechanism on the train. A few years ago, there was an incident on the Monstre at La Ronde (Montreal, QC) where the bar was not pushed down to the second click and the bar came up during the ride. The park reacted by installing individual seat belt for each rider and adding a secondary locking mechanism to the bar. That secondary lock is a small male seatbelt that is bolted to the middle of the bar and that lock into the female buckle that is bolted between the two seats. That fixed any issues and the ride continued to operate like that until the end of 2012 when the four trains were retired. This picture shows the added seatbelt and buckle. The final seating configuration for the Monstre Morgan cars. They were retired after the 2012 season. The Grizzly at California’s Great America (Santa Clara, CA) also use Morgan rolling stock and it received the same modifications as Le Monstre. Individual seatbelts as well as the back-up seatbelt for the lap bar. In 1987 for the two new trains going on the Texas Cyclone at Six Flags Astro World (Houston, TX), Morgan replaced the single position lap bar with individual adjusting lap bars. Those bars are L shaped and are ratcheted. 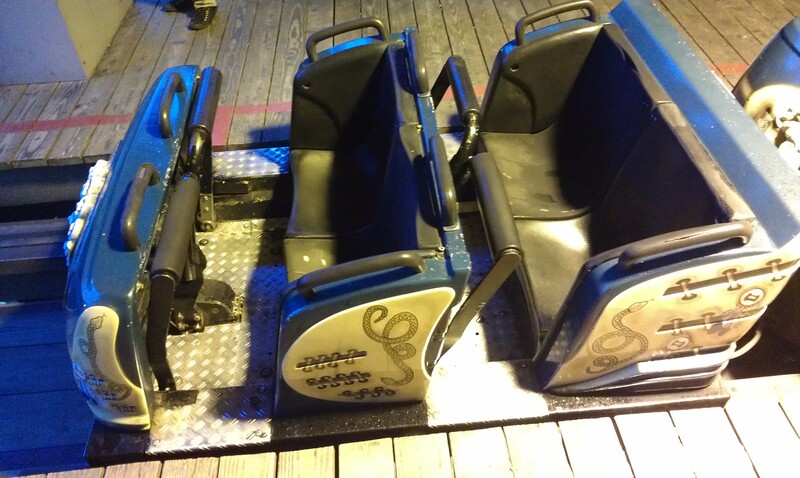 Also, in addition to concerns about tight clearances and riders complaints, large headrests were installed which completely enclose the riders upper torso and also completely block the sightline of any riders not riding in the front row. 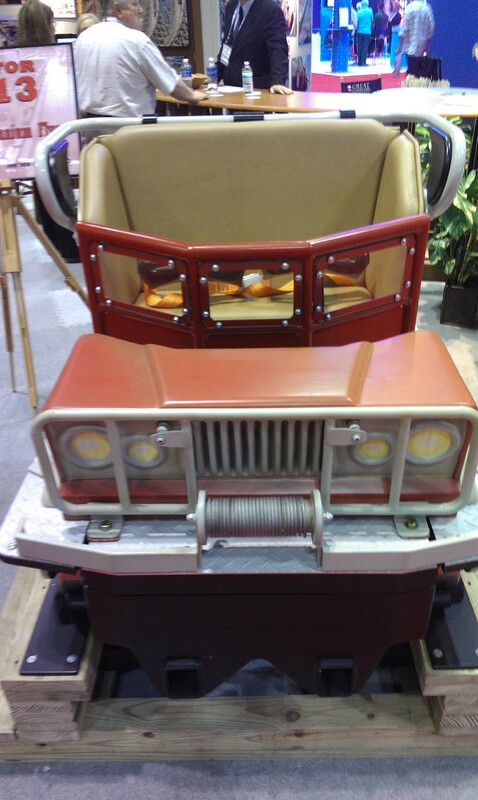 In 2001, Six Flags Astro World removed the large headrests from the cars and this immediately improved the ride. www.ellocoasters.com provided this great picture. In 1992, D.H. Morgan sold to Fiesta Texas two trains for what was at the time the world’s tallest and fastest wooden roller coaster, The Rattler. Unfortunately, there were major concerns with the forces on the train and they were replaced in 1996 by two new five car PTC Articulated trains. www.ellocoasters.com provided us with this great picture of the Rattler original 7 cars train going around the ride final helix. In this great shot from www.ellocoasters.com, you can see the Morgan train diving into the quarry wall tunnel. 1994 saw DH Morgan sell its wooden coaster train division to PTC after they delivered two trains to Yomiuriland (Tokyo, Japan) for the John Pierce designed, constructed by Roller Coaster Corporation of America (Cincinnati, OH)/Togo International White Canyon roller coaster. 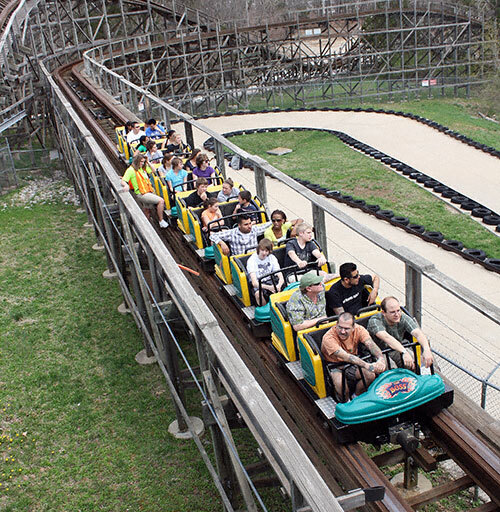 Patterned after the Texas Cyclone, this roller coaster got cars that were also modified to enclose riders. In this case, each seat has the black PTC head rest and a black roll cage was installed as well. One last thing about the Morgan trains is that they are the lightest wooden coaster trains ever designed. A 6 cars PTC articulating train with two rows per car, higher seat backs and individual restraints is 5000 lbs heavier than a Morgan 7 cars train. So, when converting coasters from Morgan to PTC like Six Flags did on three rides, you will need to modify the ride. Monstre and Rattler at Six Flags Fiesta Texas (San Antonio, TX) went from 7 car Morgan trains to 5 cars articulating two rows PTC trains. The Riverside Cyclone (Agawam, MA) went from 6 cars Morgan trains to 6 cars PTC trains in 2000, but they had to reprofile the first drop and following turn to accomodate the heavier trains the season after. 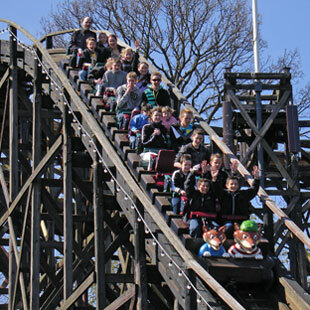 In 1998, Gerstlauer entered the wooden coaster train market. The first new installation was on the Twisted Sisters (renamed to Twisted Twins after a lawsuit from the 1980’s rock band that shared the same name) at Kentucky Kingdom (Louisville, KY). Designed by CCI, this double tracked dueling coaster got the Gerstlauer cars because the theming possibilities for them were infinite. In this case, both trains were themed to classic 1950’s cars with a lot of chrome on them. The reason this was possible was that the cars are a steel frame with a molded fiberglass body on them. There are no seat dividers and riders sit on soft foam. 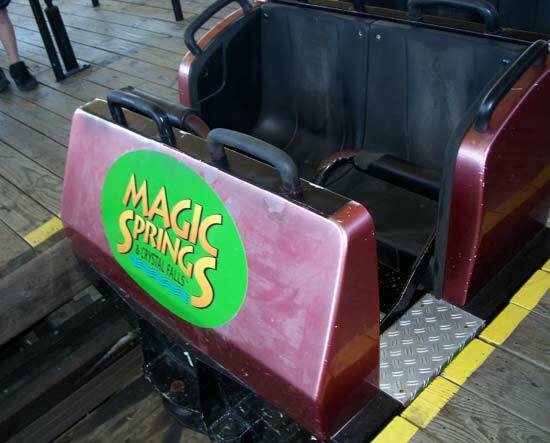 The restraint is an individual U shaped steel bar similar to what Schwarzkopf used and after 2000, the lap bars were redesigned so that they were a little wider to make riders comfortable. The tubular side bars were made flat to give more space for the legs. Two different body styles were offered on those cars: enclosed and open front. The enclosed cars are what Kentucky Kingdom got for Twister Twins and a few other parks ordered. The open front car feature steel rails at the front so that the front row riders have a perfect view of the track. Mechanically, the front wheels are bolted directly to the chassis. The back wheels are mounted on a separate assembly that is bolted to a bushing to allow those wheels to move back and forth. The fiberglass shell is bolted to a steel frame, similar to the Morgan trains and they are much lighter than the PTC trains and give a whole different experience. 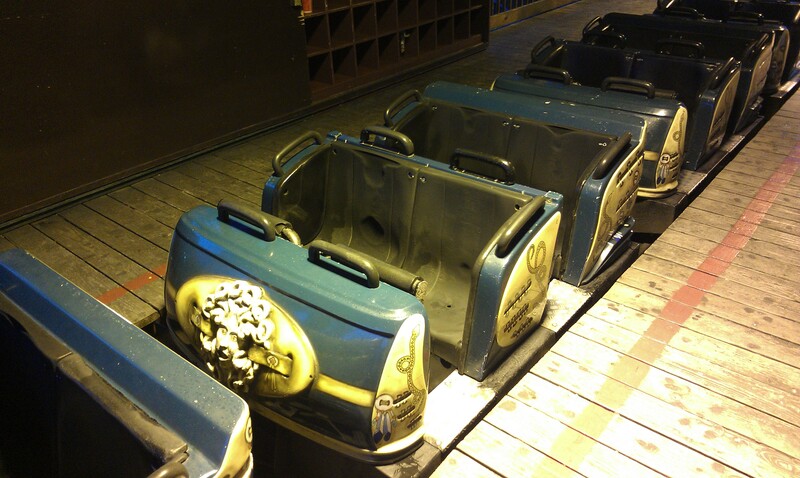 Lauren Hogan provided us with this great picture of the open front Gerstlauer train on the Boss. A look at one of the train on the Cheetah at Wild Adventures in Valdosta, GA.
Side view of the Gerstlauer open car. 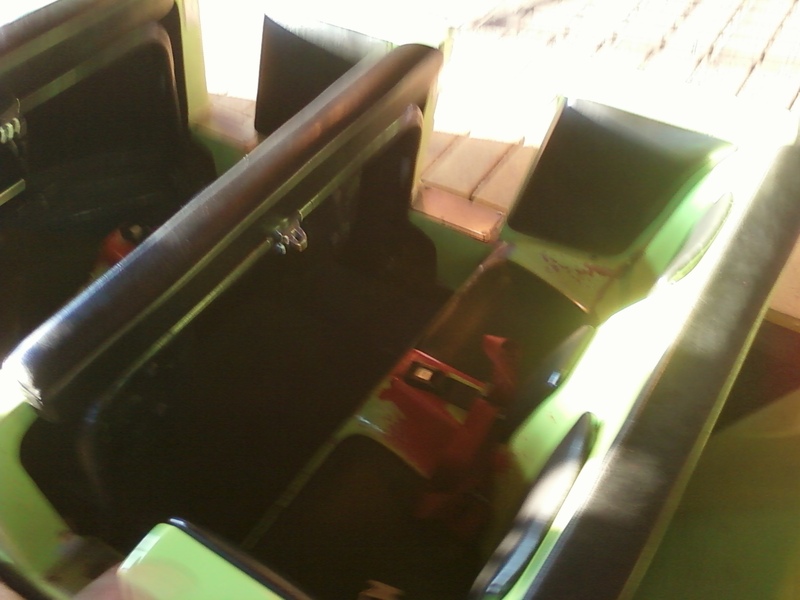 This picture show a car used on La Medusa at Six Flags Mexico. The ride is in a western themed area, so the car theming reflect that. This picture shows the seating and lap bar configuration. 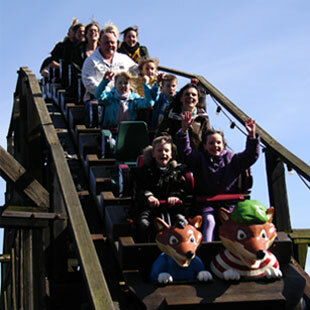 In 2004, Gertstlauer designed a brand new set of cars for the Falken roller coaster at Farup Sommerland (Saltum, Danemark). 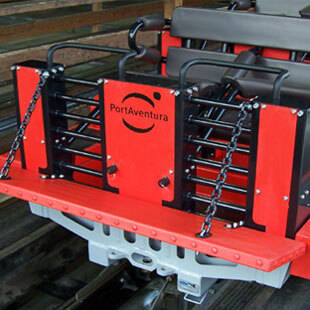 The ride was designed and constructed by S&S Power and Gerstlauer provided one train for the out and back design. The main departure from the previous trains is that the cars here have 3 rows and have a longer wheel base. They were also offered with both and closed fronts. The U shaped lap bars were replaced by a L shaped individual restraint that is a lot more comfortable. In addition to Falken, those trains were used on the 2008 Ingenieur-Holzbau Cordes ride, Mammut at Erlebnispark Tripsdrill (Cleebronn, Germany). This was Ingenieur-Holzbau Cordes first stand alone project, as they had previous done 3 projects for Intamin AG and Stengel Engineering office. 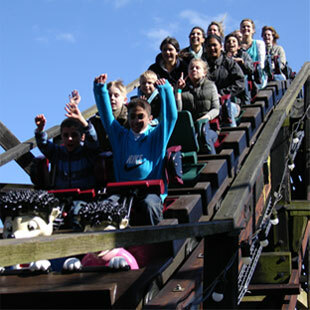 Cordes was the main building material supplier for the acclaimed “Plug n Play wooden coaster” of which 4 were delivered between 2001 and 2008. 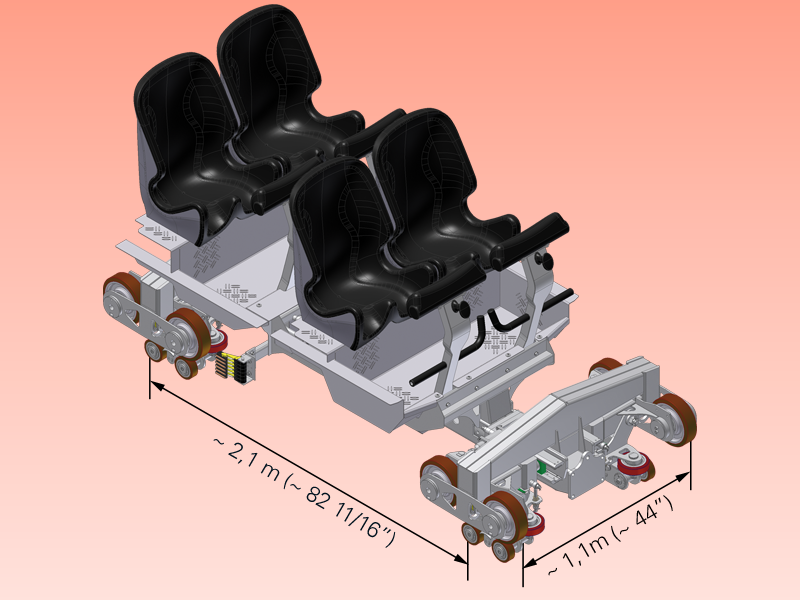 In 2011, Gerstlauer offered a new type of car: the Hybrid Coaster Car. The hybrid come from the adaptable design that allow them to run on either steel or wooden track. The cars are a clean sheet design, featuring a trailered design that allow them to any maneuvers that the designer can come up with and do it smoothly for the riders. Each ride sit in a bucket seat and a lap bar and seatbelt secure the rider. Continuing with the traditional of molding car bodies to the customer request, you could have the front of a 1950’s classic American car with longhorns or a giant snake. Mechanically, the wheels use Ackermann-Steering for the front axle in order to follow each turn perfectly. The restraints are T shaped and are hydraulic to allow an infinite number of positions. Sensors are used to make sure each lap bar is down to a proper position. Individual seatbelts are now used for each rider’s in addition to the lap bar. 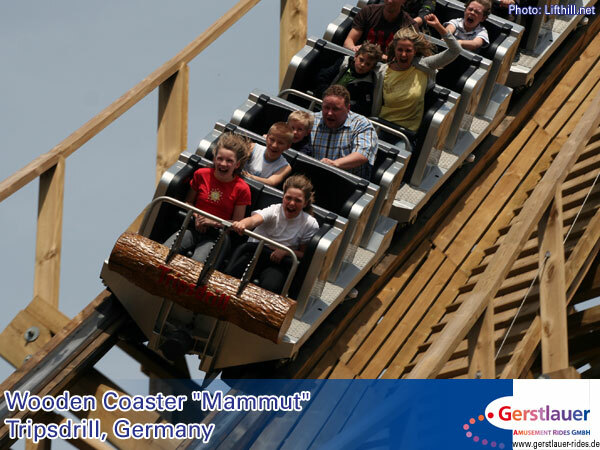 To conclude with Gerstlauer, the wooden coaster is still offered by them and they will use their revolutionary construction process combined with the Hybrid Coaster Car to provide one of the most durable and thrilling ride offered on the market today. After using articulated two rows trains from PTC for their first 3 projects, GCII designed their own train. Taking the classic and legendary Prior & Church trains, Mike Boodley designed the “Millennium Flyers”. Those are trailered articulated trains with a short wheel base and a ball hitch, allowing tight turns and quick transitions. Due to concerns with using prototype trains, Six Flags had GCII design Roar! (1999, Six Flags Discovery Kingdom, Vallejo, CA) so that it could be retrofitted with PTC articulated trains if the new product could not perform. The Millennium Flyers trains are usually composed of 6 or 12 cars, connected together. Each car has two seats and feature two ratcheting lap bars. The wheel assembly is bolted directly to the chassis and cannot move, so it is the short wheel base and ball link that do the job. One interesting feature is that to make sure the restraint is at the proper position, the first ratchets are not felt until the bar reach a certain point. Then, the ratchets engage and the bar is locked. A seat belt is also present, except on Wodan Timbur Coaster at Europa Park (Rust, Germany). 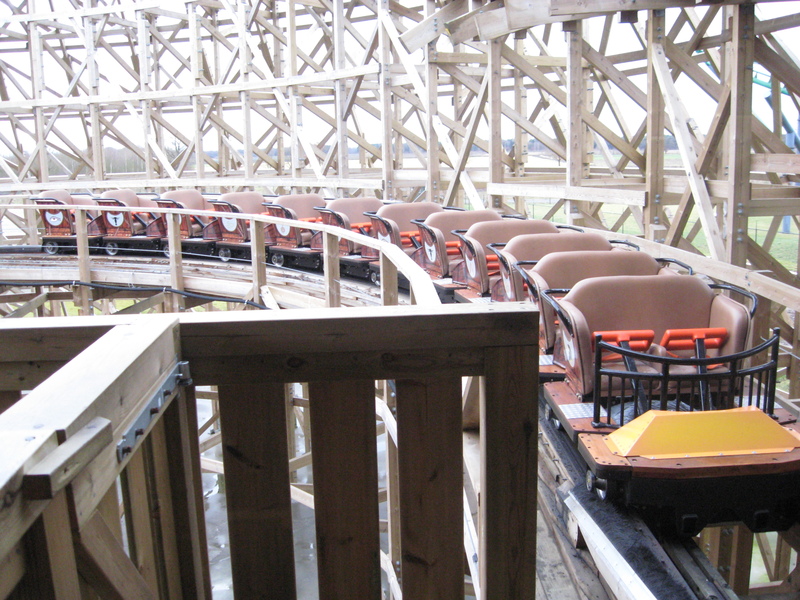 This is one of the two train used on Troy at Toverland (Sevenum, Netherlands). Pay close attention to the lap bars as those are the old style with a rectangular shape. 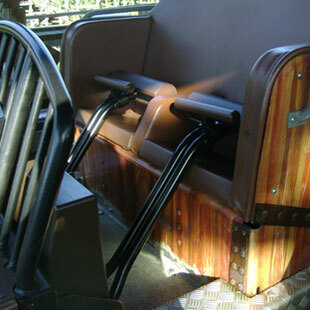 In 2010, at Efteling (Kaatsheuvel, Netherlands) request, GCI redesigned the lap bar on their trains to lower the height restriction. What they did is that they curved the bar that rest on the passenger’s lap and this allows the park to have a 46 inches height restriction for the middle cars versus the standard 48 inches height restriction on other GCI coasters. This worked out well enough other parks started replacing the older style bars with the new ones. A look at the Millennium Flyer train on the Python in Bamboo Forest. Located at the Wanda Theme Park in Nanchang, China, the trains were highly customised. The park went with soft foam for the seats instead of the usual leather covered foam seen on Millennium Flyer trains. A look at the side details and seats. The usual Timberliner seats, on Gold Striker at California’s Great America (Santa Clara, CA). In 2013, GCII unveiled at IAAPA 2013 the “Mini-lennium Flyers”. They are scaled down Millennium Flyers that feature the same restraints and were designed to run on narrower gauge wooden coasters. The first ride to get them is the Coastersaurus at Legoland Florida (Winter Haven, FL) and they debuted during IAAPA Attraction Expo 2013. 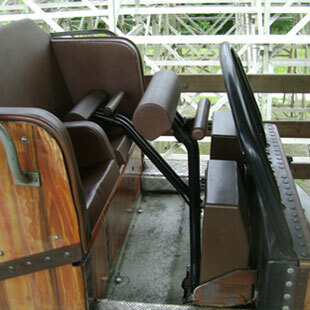 The main difference is that the seat dividers was removed and instead, in the case of a single rider, the other lap bar come down fully and prevent the rider from sliding under his lap bar. In 2000, Vekoma got into the wooden coaster train business. For 3 rides in 2000 and 2001, they designed and built a whole new train design. They were curious creations, being hybrids of both GCII Millennium Flyers in design combined with the size of the PTC 3 bench articulating trains. So, those cars featured an open front and a bench seat divided with a padded seat divider. The back axle is articulated and the front axle fixed, so those cars need to “glide” around the turn, like the PTC articulated trains. The train on Loup-Garou features a beautiful front grill and design. 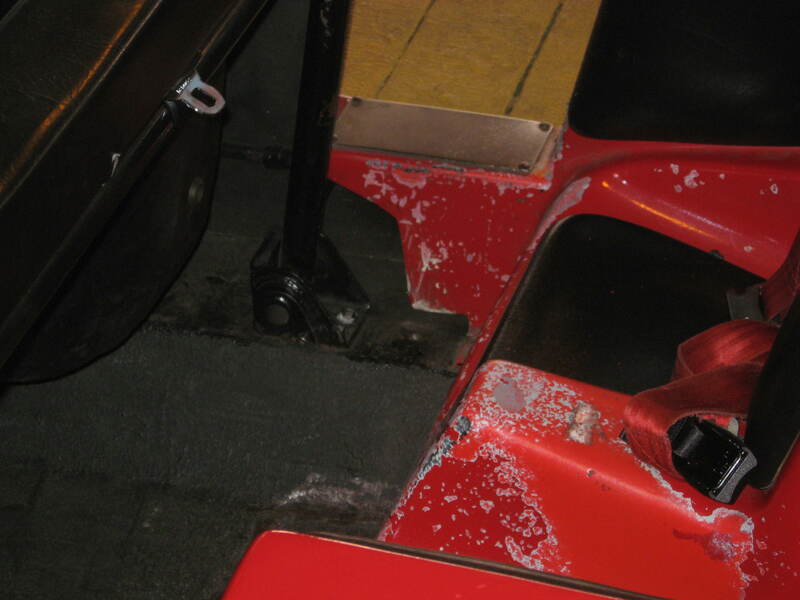 The seats and lap bars used on Loup-Garou in 2001. 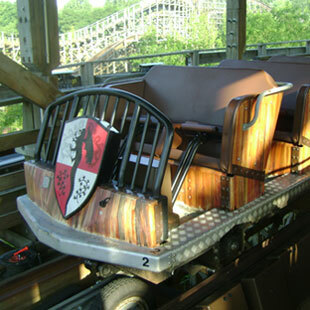 In 2010, Kumbak (founded in 2001 by ex Vekoma engineers) was called upon by Walibi Holland to upgrade the restraints on Robin Hood. They went from a mechanical ratchet design to an indefinitely adjustable hydraulic lap bar. The donut bar was also removed and replaced by a more classic padded bar with a grab handle so that ride operators can more easily check restraints in the station. The next 3 pictures show the Kumbak bars on Robin Hood. 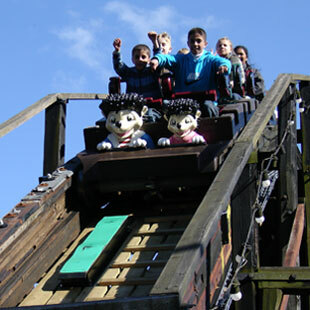 In 2007, Kumbak was hired by Port Aventura (Salou, Spain) to upgrade the 1997 CCI racing wooden coaster, Stampida. In addition to adding eddy-current magnetic brakes and a control system, four new trains were designed and manufactured. Basically, the park wanted to go in a different direction after doing what they considered excessive maintenance on the PTC articulating trains that were furnished by CCI at the time of construction. Kumbak came up with an open car design that were made to look like stage coaches. Also, unlike the PTC trains, both axles on each car can pivot and move in order to better turn and not damage the track as much. From a maintenance point of view,. the trains are a lot easier to take care of as they were designed to have a fatigue resistant chassis. The park, as of 2013, is still running on the spare parts that Kumbak sold them as a part of the upgrade in 2007. The only negative thing with them was that riders comfort was not optimal and that is something that Kumbak worked on, trying to add padding and better rider-vehicle interaction. Restraint wise, the ride feature U shaped level 5 hydraulic bars. In 2010, Bakken called upon Kumbak to do an upgrade on the classic 1935 Rutschebanen. The ride is a classic side friction (the ride does not feature upstop safety wheels on the train and it is the careful design and braking from the on board brake man that keep the train on the track) Scenic Railway and the park wanted to take it in another direction. A new braking system (as mentioned in another article) was designed and implanted with no major modifications to the ride structure and track. Then, new trains were specially designed for this unique project. They feature a single row per car configuration and a trailing axle design allow for tight turning radius taken in the smoothest way possible. For a simpler design, the wheels feature a railroad steel wheel style flange that removes the need for guide wheels. 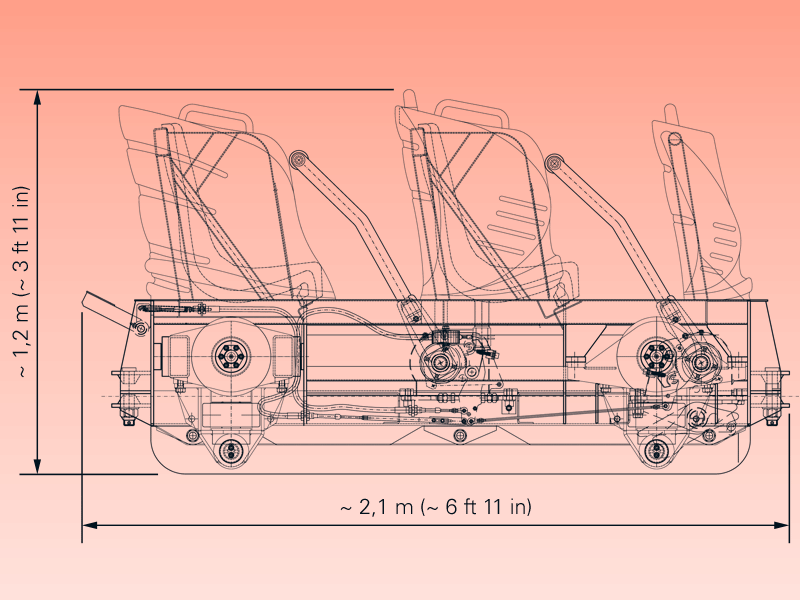 Each rider has an hydraulic adjustable T bar to stay secure inside the open style seats. The park mascots are featured on the front car. This entry was posted in Coasters and tagged D.H. Morgan, Gerstlauer, Kumbak, Vekoma, wooden coaster. Bookmark the permalink. ← Stunt Shows around the world: Part 7 of our Fire! serie.